Over the last few years, we've seen a rise in kids committing suicide from being bullied. As adults, it's up to us to stop bullying when we see it. 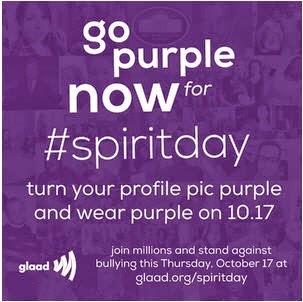 GLAAD is asking that we turn our profiles on social media and our shirts purple for Spirit Day, a day that is designed to show support for LGBT kids and show them that there are people out there that care about them. Take a moment to follow the link to turn your profile purple to take a stand against bullying.